Two more counselors tonight shared some of their past with the campers. They talked about how God gave them miracles and how they got through the hard times when they thought that they couldn't move forward. They both talked about how we aren't alone, God is always with us to protect and guide us.We need to believe in ourselves and in God. It's a love I don't deserve, but You love anyways. Organized Mass Chaos was tonights Evening Extravaganza. 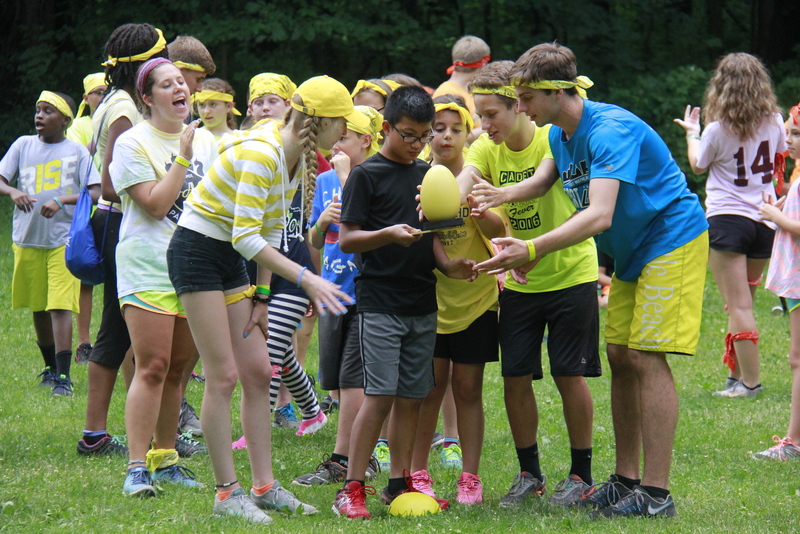 Campers participated in tons of silly activities like paying leap frog, singing happy birthday to people, or putting shaving cream on people The campers throughly enjoyed OMC. Diner tonight was chicken strips, potato wedges, cooked carrots, salad, and dirt pudding! This afternoon campers had to opportunity to climb the climbing wall, shoot a bow and arrow, swim, and many other things. At archery today the campers learned that shooting an arrow is kinda like life, things may not always go our way. Lunch this afternoon was sloppy joes, potato chips, mandarin oranges, and salad. This morning campers were able to enjoy activities like the zip line, the AquaGlide, and the swing. At the zip line this morning the campers were very encouraging to their cabin mates when one of them was scared to go down. They were able to work together for encouragement and the camper going down worked with God to trust that they were going to be okay and have fun on the zip line. Work With God. Campers this morning learned about Jesus feeding the 5,000. They learned that Jesus actually fed more than 5,000 people and it could have been closer to 10,000 people. In the story they learned that Jesus made one Childs lunch of 5 loaves of bread and 2 fish and turned it into a meal for everyone and Jesus and the disciples had 12 baskets full of food leftover after everyone had eaten. And Jesus replied "My Father is still working and I am working too." Breakfast this morning was biscuits and gravy, potato triangles, and cereal. One of the counselors shared part of their story and how they dealt with all of the changes. They shared some of their struggles from dealing with all of the changes and how they came to be a part of camp. Another counselor shared some of their struggles with the campers and how they found Jesus in a man that they didn't expect to see Jesus in. They shared how even though they weren't sure of God's plan and timing of things that everything still worked out and just how great God is to us. Here are some of the songs the campers sang tonight. One thing that both of the counselors wanted the campers to get from their stories is that God will never give up on you and He always has more for you than you could ever imagine. Campers tonight participated in some wacky water relays. There was a wet shirt relay where they put on a shirt then ran into the lake and ran back to wring the shirt out into a bucket and an over under relay race with a sponge. Dinner was pizza, breadsticks, and salad. 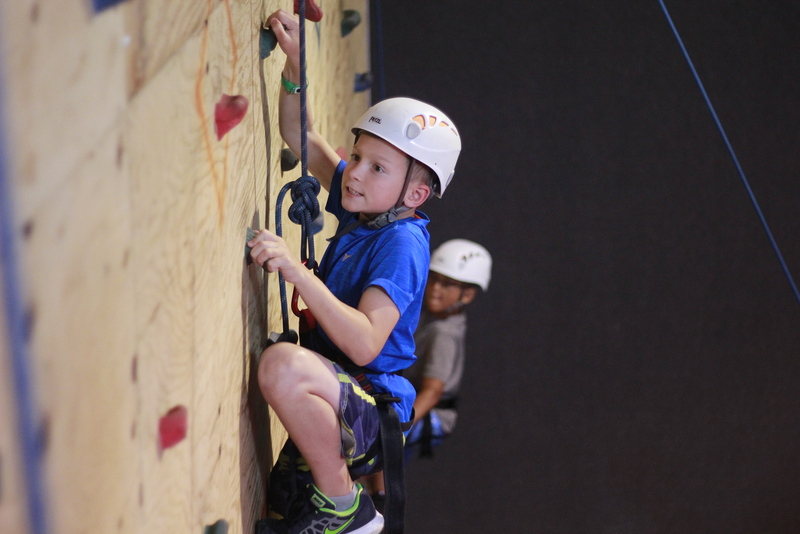 This afternoon campers were able to go swimming, participate in team-building activities on the Adventure Trail, climb the rock wall, and many more activities. Lunch today was corndogs, macaroni and cheese, applesauce, and salad. Campers enjoyed some time in the water at the AquaGlide, at the zip line, and the swing. At the AquaGlide they were able to race a friend on the activity track and just have some good fun with one another. This morning campers heard the "Parable of the Mustard Seed". They learned that even though it started out super duper small, that it would grow big and strong and bigger than any garden plant. The mustard seed is like our faith. It starts out small, but over time while we learn about God and share God with others, our faith grows and grows. Breakfast this morning was waffle sticks, sausage links, and crispy potato cubes. 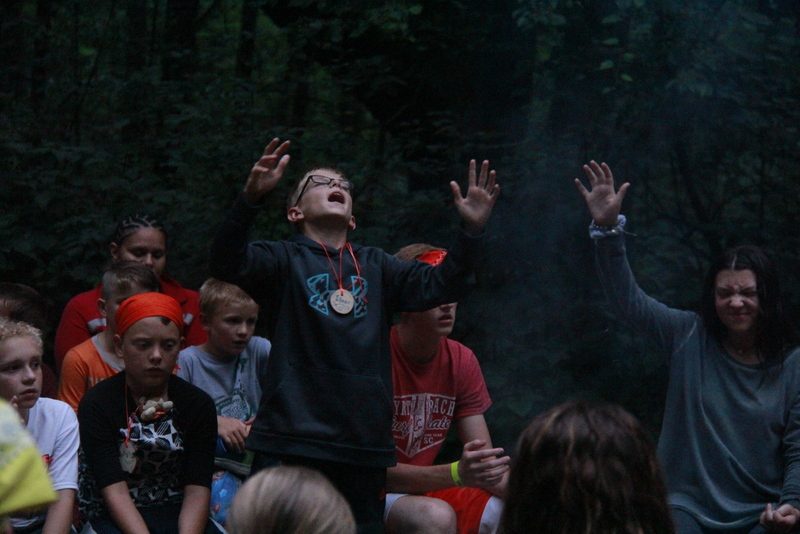 The campers love worship time at Vespers. Here are some of the songs they sang tonight. 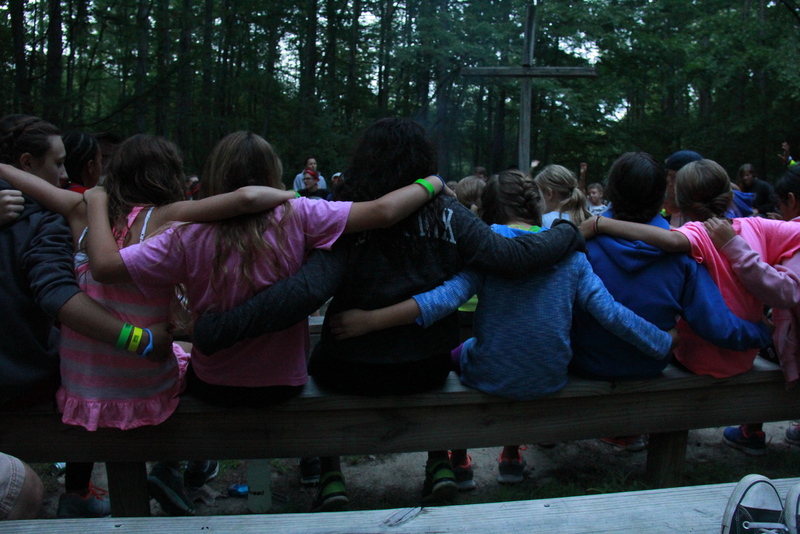 Another one of the counselors shared a bit of their life and why they love camp. One of the big things they talked about was trusting in God's plan and how it is like doing a puzzle without the box. We guess where the piece goes and then there is the voice in our head guiding us to where it goes. With God we may not always know what His plan for us is, but God will always reveal His plan to us. We may not know what is next for us in life, but we should always trust that God has the best plan for us and that He will never leave us. The dinner menu for tonight was chicken drumsticks, potato smiles, corn, and salad. This afternoon some of the activities the campers did were the climbing wall, the swing and the adventure trail. 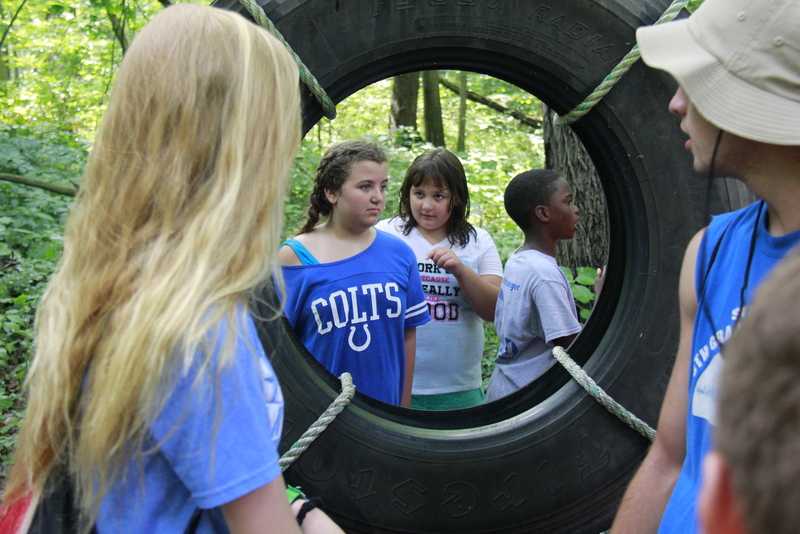 On the adventure trail they learned that they needed to work together in order to succeed through the activities. Check out more of the photos here! For lunch today the campers enjoyed taco's, nacho's, and churro's! This morning campers enjoyed things like the AquaGlide, the swing, and the zip line. With activities like the zip line and the swing, the campers are learning to put their faith in things such as the poles, the cables, and the staff. Campers this morning learned about Building With God. They read from Ezra about the people building the temple and how when they laid down the foundation they shouted for joy and could be heard for miles. Breakfast this morning was eggs, bacon, an cheesy hash browns. Here are some of the songs that the campers worshiped with tonight at Vespers. Tonight one of the counselors shared a bit of their life and some of the things that they struggled with. They shared how going through those struggles led them to where they are today and how using their stories they can help other learn lessons from God and realize just how great our God is. For Evening Extravaganza tonight campers and counselors participated in games where they went head to head with the other cabins. Here they again learned that working together was key in the relay races and finding the right puzzle pieces. For dinner tonight we had lasagna roll-ups, breadsticks, green beans, and chocolate chip cookies. This afternoon campers spread out across camp to experience things like the zip line, the swing, the climbing wall, and many other things. 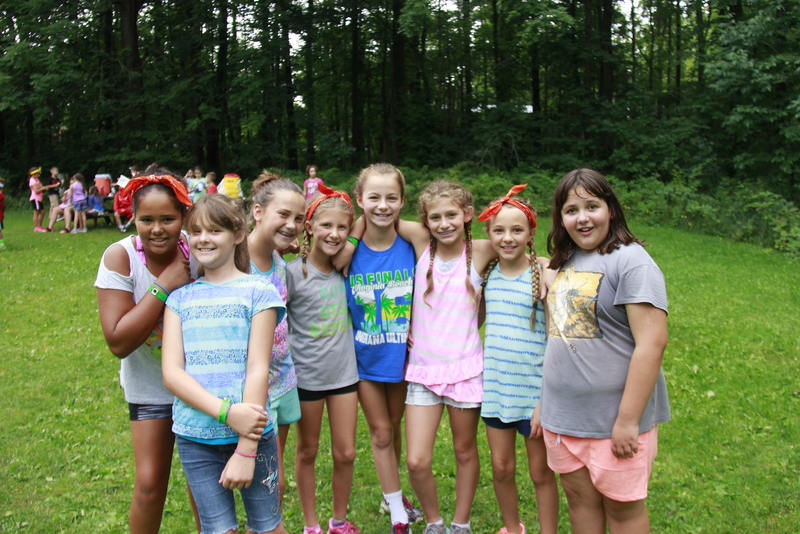 Through these experiences, they learned that they needed to work together to help their cabin mates go up on the swing or encouraging their friends to go down the zip line. Make sure you check out more of the photos here! On the menu for today was breaded chicken sandwiches, tater tots, pears, and juice. While is may have rained a bit here at camp, everyone is doing well and still having loads of fun! This morning they learned about Esther and how she Imagined With God. Esther realized how important it was to save her people and she used her imagination to tell the King of Haman's plan and when she tole the King, he changed his law because Esther was brave and she was able to imagine with God. For breakfast this morning campers enjoyed french toast sticks, triangle hash browns, and sausage links. At Vesper Hill tonight campers learned that Vespers is a holy ground. Vespers is a special place where campers, counselors, and directors gather each and every night to worship the Lord and hear God's word. Tonight they looked up at the trees and saw the goodness that God had created. Tonight after dinner campers took their swim tests and played some fun games in Pine Meadow! For dinner the campers enjoyed hamburgers, french fries, apple sauce, salad, and juice! 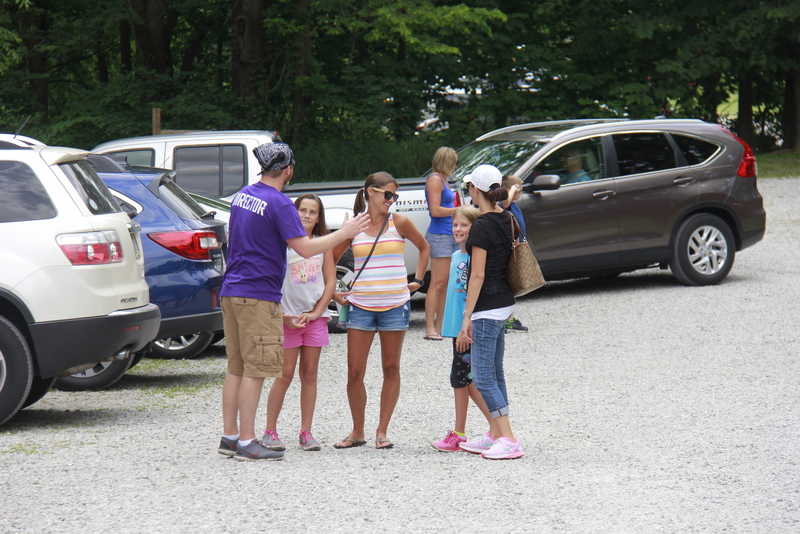 Check-in went great and the campers are already off to lots of fun!